Today, for Something New Something Old pottery, we have something old. 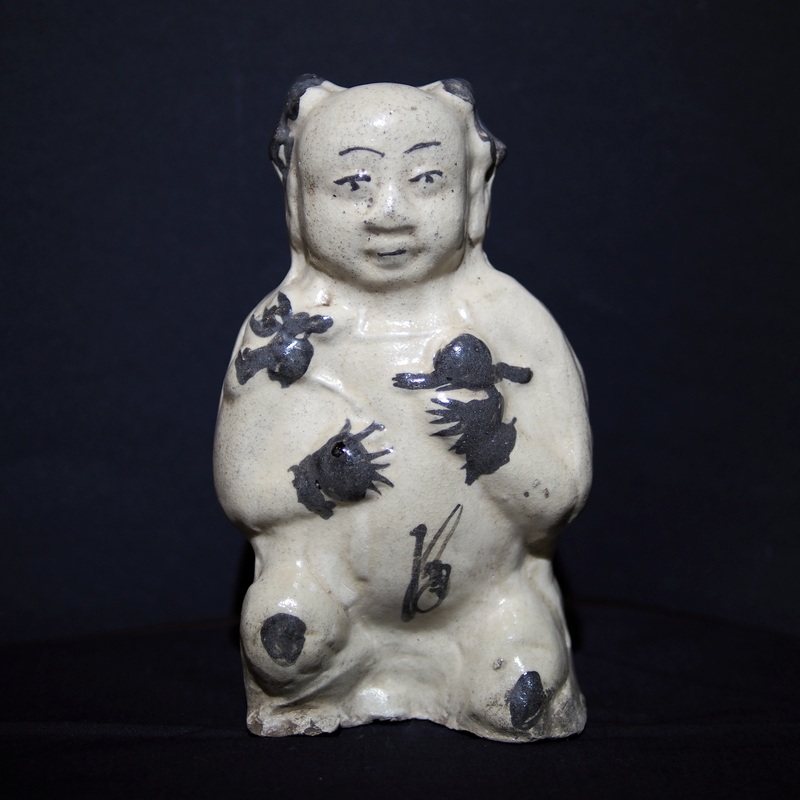 A figurine of a boy holding a lotus made in the Ci Zhou kiln. On further research, the boy’s name is Mo He Yue, the Chinese folk portrayal of the Buddha Siddhattha Gotama’s son – Rahula. Rahula was born before Prince Siddhartha was enlightened to become the buddha, being raised by the his mother and grandfather King Suddhodana. When Rahula was 7 year old, the Buddha returned to the palace, on the 7th day his mother Princess Yasodhara told Rahula to ask his father for the inheritance of the crown since the Buddha has already renounced his duty as the prince. The Buddha knowing the crown goes with the worldly life is full of trouble, so instead gave his son spiritual enlightenment. The Buddha asked his disciple Sariputta to ordain Rahula who later became one of the arhants. Since the Tang dynasty, figurines of Mo He Yue have been used for the worship for the Qi Xi festival (7th of lunar July). However, the Qi Xi festival has nothing to do with Buddhism but a celebration of love between a cowboy (Nin Lang) and a weaver girl (Zhi Nu). The love story goes something like this; a poor boy called Nin Lang who live with lived with his brother and the wife. The sister in law was not keen on having a boy hanging around and had a cunning plan. She asked Nin Lang to herd 9 of her cows but on his returned claimed that there were 10, if Nin Lang didnt manage to find the 10th cow he will not be allowed home again. Nin Lang found a sick yellow cow on the hill, he nursed him carefully until the cow regained its health. The cow was very grateful and revealed that he was actually a saint who has been strike down to earth. The cow became a buddy of Nin Lang and told him a place on earth where the female saints would hang out and there Ning Lang met Zhi Nu. The 2 soon fell in love with each other and had a twin. The Queen Mother of the West (the supreme head of all female saints) found out this forbidden sin, a earthy being having children with the saint, and escorted Zhi Nu back to heaven. Seeing that Nin Lang became very sad at the departure of his wife, the cow told Nin Lang that after his death, his skin could be used to make a pair of shoes that could bring Nin Lang to heaven so he could find Zhi Nu again. Years later, the shoes were made, Nin Lang flew to the sky and saw Zhi Nu at a distance. The Queen Mother of West throw a hair ornament which became the milky way separating the two again. Moved by their love, the pica pica birds formed a bridge to help them cross the milky way. The Queen Mother of West touched, made an exception for them, once a year on the 7th of lunar July, the 2 are allow to meet on the pica pica bridge. This story is of course a conception of the early Chinese astronomy; Nin Lang being Altair, Zhi Nu being Alpha Lyrae, the yellow cow – the Aldebaran and of course the Milky Way. Since the Tang dynasty there has been the worship of the 2 lovers, in particular Zhi Nu, the weaver of colourful clouds in the sky. It is believed that the girls would pick up her skillful hands. Now what has Rahula, the son of the Buddha got to do with the 2 lovers. It has to do with other custom of Qi Xi, as it is a night of the union of the lovers, baby figurines were made as a symbol of conception of the much desired baby boy. By Tang dynasty, with the arrival of Buddhism from India, these baby figurines were made into Rahula who is gifted and grown to be an arhant, an image of a son everyone wished for. Rahula, being left behind by the Buddha at birth but eventually enlightened and preached by the Buddha. This reunion fulfilled the void left behind the by separation of Nin Lang and Zhi Nu. Slowly, the figurine changed from their role of being worship to being admired and by Sung dynasty when technique of molding was made popular, the Rahula (Mo He Yue) figurine became a toy. Old simple Very charming Little Boy. Is he for sale? If so How much please? yes, the figurine is for sale HK$1,260 (app US$165) excluding shipping and packing. Hello spike, found this all by looking to find info about Blessing Poles. I had never seen them before. I have learnt here, so much more than I expected. For some unknown reason, happily I have been collecting very old, vintage & of course fallen for some fakes of Chinese origin. My Peacock is my pride he stands at least 3mtrs tall moulded, painted & fired, on a clay moulded stump by a master I am sure. It has a plaque impression but I cannot decipher the script or the stamps. The postage & ship the little boy would probably be too much for me, but it is ok to wish for things. I have committed at the moment my spare $ to an original collection of 1926 pictures of Chinese Temples & Surrounds. Thank You ever so much for your reply. I will keep an eye on him though Ha Ha. its wonderful to met craft lovers all over the world. 3m tall pottery peacock that must be so stunning! which country is it from?